In India, not many people associate angling with sport. After all, the idea of buying expensive and often difficult-to-source equipment, walking for hours to get to the right tract of the river or sea, casting the line and waiting uncertainly for a careless monster to bite, then being involved in a treacherous struggle with an invisible competitor, and at the end of it all, releasing it back into the waters after the customary rituals of weigh-and-pose-for-a-photograph, does sound a little foolish. Especially when a delicious bonfire-browned meal of roast fish is not the inspiration for so much sweat and toil. It’s the adrenalin rush you get when you feel a tug from the other side and the intricacies of a highly technical activity that tests the limits of patience. “Angling is among the most pure forms of sport," says Saad Bin Jung, owner of the Bush Betta Angling Camp on the Cauvery in Karnataka. “Everything works against you in this one except your perseverance and character." Sport fishing (or game fishing) has never really got the attention it deserves in India. “If it were not for some anglers’ associations, and nature loving NGOs, the requiem for angling would have been sounded a long time ago," says George Richmond, president, Assam Bhoroli Anglers and Conservation Association, which runs an Eco-Camp at Potasali, Assam. “The silting of rivers because of deforestation, shifting ‘jhoom’ cultivation, sand extraction and boulder extraction for construction work have played havoc with all species of fish population." The monsoons are thankfully over, coastal waters are clear and smooth, the mahseer is sharpening its teeth in anticipation of many legendary contests (the trout can, meanwhile, rest for a while, hidden in the chilly streams of the Himalayas), and anglers have packed their bags full of fresh bait or artificial lures. They are heading to the numerous angling hot spots across the country, some well known, some blissfully hidden, looking to top the last big one. We bring you a round-up of these exciting fishing holidays from across the country. Misty Dhillon, 29, has been fishing virtually every weekend since the age of 15. Dhillon, who co-owns the Himalayan Outback, inherited a love for angling from his father, who was in the army. He has taken it a step further by popularizing the concept of float trips—expeditions on a raft along a river, to scale previously uncharted territories. “The idea is to take angling to areas that are offbeat and non-commercial," he says. He lists the Ganga at Devprayag, the confluence of the Saryu and Kali rivers bordering Nepal, the Yamuna near Nahan and the Giri river at Jataun. All the trips operate on the philosophy of catch-and-release—according to Dhillon, this is a necessary condition for all anglers to get a licence to fish. Saurabh Makhija, a 28-year-old New Delhi-based marketing professional with Nestle India and an avid angler, who has been on a couple of these trips, vouches for the facilities offered by the Himalayan Outback. “Their logistics support is fantastic, right from the fishing gear, the camping equipment to the knowledge of these not-so-accessible locations," he says. For both Dhillon and Makhija, nothing matches the sheer thrill of lining up against the mighty mahseer (Makhija says the trout is ‘too delicate’ for his liking). “It’s like an alligator pulling from the other side, and you need both brain and brawn to succeed," says Makhija. Fishing season: Anytime, except June to September. Facilities: Fishing guides, two cooks, safety kayaks, river guides and a trip leader. Cost: A five-day float trip starts at Rs35,000. For details Log on to www.himalayanoutback.com. Towards the north-eastern periphery of the Corbett Tiger Reserve, the Ramganga enters the protected area. The river, which has been christened “Mahseer Haven", is known for many different and challenging species of fish such as golden mahseer, goonch, kalabanse, Indian trout and mulley. On the banks of the river, the Riverine Woods Vanghat lodge boasts of five cottages— four of them made from local bamboo and thatch, and a single stone cottage with slate and a hardwood ceiling. Sumanta Ghosh, a naturalist who runs the lodge with his UK-based partner, J. Mehta, says it is a community-based project. Five per cent of the total turnover of the lodge is contributed to the local villages, in addition to 55-65% of the rod fees charged from the anglers. The lodge has been awarded a 4km-beat of the river on a catch-and-release condition, but anglers can try their bait anywhere on the 24km stretch where fishing is permissible. Stefan Burnert, 37, from Sweden, who has been sport fishing for the past 25 years, has stayed twice at the lodge, in 2005 and 2006. “For the last 15 years, I have been travelling around the world in search of the biggest freshwater fishes, and at Vanghat, one can find two of them, the goonch and the golden mahseer." Burnert has fond memories of the time when he woke up one morning to find tiger footprints right outside his hut. “To be in the jungle of “Sher Khan" and have a five-star lodge to sneak back to after a day at the river...it can’t be any better," he says. Fishing season: 15 September to 30 May. Skill set: None required, but the lodge discourages frivolous fishing. Facilities: Each cottage consists of a bedroom, a study and three verandas. The lodge serves both Continental and Indian food, with local specialities such as stinging nettle, wild figs and smoked goat in a thatch-roofed dining hall. Other perks include a small library, soft drinks, transfers from Ramnagar to the lodge and elephant safaris. Fishing guides are available. Cost: $200 per person, per night, for non-Indian nationals and Rs12,000 (plus 5% tax per room) for Indians (on a dual-sharing basis). For details Log on to www.vanghat.com. Glen Simoens, 40, the founder of the club, calls rawas (threadfin or Indian salmon) the prince of the tides. Many years ago, at the age of 18, he caught his first one and remembers his hand bleeding when the hand line pierced his fingers as he tried to resist the brute force of the fish. Though rawas has become increasingly rare along the coast, Simoens and other regular members continue to venture out almost every weekend in search of other big catch such as cobia, marlin, sailfish, sheepheads, jewfish, catfish, red snappers, spanish mackerel... .
“I had been angling alone for a long time but when I put up an advertisement in a newspaper in 1994 calling for people who were interested, I received about 600 phone calls," Simeons says. The Himalayan Outback float trips involve rafting to inaccessible tracts of the river which are productive for angling. Newton Thomas D’Souza, 46, assistant restaurant manager, Taj Mahal Palace & Tower, Mumbai, and Simoens’ angling buddy, was introduced to the joys of the sport way back in 1969. For him, it was the sheer thrill of lining himself up against the fight put up by the fish. “All the odds are stacked against you," he says. “You need to know when to leave the line as the fish is swimming away and when to pull it back. You can literally nachao (manoeuvre) the fish on your index finger." Another regular on these trips is Lionel Pereira, 44, who owns a recycling business in Mumbai. Pereira has been angling for more than 15 years and has been associated with the club for the last 10 years. “I have done some freshwater fishing but I definitely prefer the sea," he says. “On the sea, it’s not about fishing only, it’s about being cut off from the rest of the world and concentrating on the smallest activities on the surface of the water. It is a form of meditation." Fishing season: 1 September to 15 January. Facilities: All fishing gear including global positioning system (GPS) and electronic fish finder, meals and accommodation. Cost: All the members share the expenses incurred during the trip (a four-day land-based trip on an average costs Rs5,000). For details Log on to www.kraigjarvisfishingclub.com. The banks of the Cauvery river around Bangalore are undoubtedly the angling capital of the country. The river abounds in giant mahseers, the largest of which has been reported at a whopping 59kg. Jung, 47, a former Ranji cricketer, has caught one weighing 48.5kg. “The waters here are perfect for big fish. 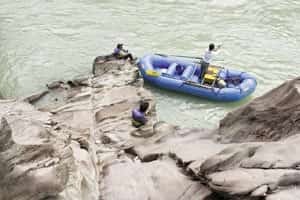 Not only do the deep pools ensure that the water is cold, and hence can hold more oxygen, the rapids provide the ideal conditions," he says. Saad Bin Jung has been in the area promoting ecotourism for more than 10 years. Not only are the fish released once they are caught, the camp provides all the details of the fish weighed to the local authorities to enable them to ascertain the health of aquatic life in the river. “We don’t want trophy seekers or people who are not interested in conservation at the camp," he says. The camp has a policy of hiring local youths to patrol the area for poachers. Peter Smith, 56, who is based in Wales and has been fishing in the Cauvery for the last 30 years, assists Bush Betta with its conservation efforts. He says angling is used solely as a tool for conserving the mahseer. “Guests at the camp man the anti-poaching activities, look out for traps and snares and assist in conservation," he says. Smith recalls an incident at dinner a while ago when they heard that poachers from across the state border had torched the camp and boats. “The only boat that was not burning was drifting out into the current. One of the guides cast a naked hook to retrieve the boat and, incidentally, it was taken by a 14.5kg mahseer," he says. Smith had to divert his attention to landing the stubborn creature at the unlikeliest of moments, while the camping staff went on to arrest the poachers and marched them off to the authorities. Fishing season: December to April. Facilities: Huts and tents with running hot and cold water, all meals in a central dining area. Beer and cold drinks available on request. Cost: Rs5,000 per night per person. Located inside the Namheri National Park on the Jia Bhoroli river in Assam, this camp is a favourite stopover destination for tourists and pilgrims heading from Tezpur to the Tawang monastery in Arunachal Pradesh. The camp is run by the Assam Bhoroli Anglers and Conservation Association, a registered NGO involved in conservation and pisciculture. All anglers need a fishing licence and a permit. Though the camp works strictly on a catch-and-release basis, one can fish upstream or downstream for food. The river saw better days in the early 1990s, when it was regarded as an angler’s paradise, but it is still a popular destination. “Around 25-30% of the anglers at the camp are women. Also, many youngsters and college students are keen on the sport," says George Richmond, president of the conservation association. The camp has eight large tents, two bamboo huts, two basic cottages, all with tiled bathrooms, and a dormitory for students. Dr Atul Borgohain, a life member of the association, has been fishing in the area for about 20 years. His biggest catch on the river is a 16.5kg golden mahseer, though he says other species such as chocolate mahseer and Indian trout are also common. “Since there are no roads in the area, the only way to fish is to raft down the river in inflatable rubber boats provided by the camp." In addition to angling, the camp offers (on extra charges) jungle treks in the Namheri National Park (which is also a tiger reserve), 18km of river rafting, interaction with local villages, including ethnic shows, and a host of opportunities for bird and wildlife watching. “Around 135 species of birds have been identified in the camp itself," says Richmond. Fishing season: October-end till May. Facilities: Fishing guides and forest guides available. Cost: On twin-sharing basis for Indians, a tent costs Rs800. For non-Indian nationals, it is Rs1,150 for a tent on a twin-sharing basis. Plus temporary membership charges. Meals are charged extra. A bed in a dormitory costs Rs100.